Today was our big day. We were down at the coast for three days, but our first and last days also included travel back to London. As such, we could only walk for half of those days. In this, our middle day, we wanted to put some miles in and get to Portland. It didn’t quite go to plan at first. The day before we had finished at a car park with the intention of starting today’s walk from the same place. When we got there, however, we realised we had to pay the parking charge at a small shop selling beach accoutrements and ice cream. It was 7:00 am; the shop wasn’t open. We had no choice but to drive about two-thirds of a mile inland and park at a larger, free, car park. It was a beautiful day as we started our walk. Chesil Beach sat stretched out in the distance with our prize sat at its far end. We started out, striding purposefully towards our goal. Almost immediately we got lost. Our map was clear, but the terrain didn’t seem to match it. I checked our GPS. It matched neither the terrain nor the map. We hadn’t even started and were lost already! Although we were headed west I saw a promising path leading back east, and both our map and GPS agreed that this led to a track which would take us straight to the coastline. We followed this track off into a meadow. There was knee-high grass all around us, but our track cut through this, almost as if a lawnmower had been through. So far so good, but soon we were lost in a maze of criss-crossing lawnmower tracks, going off at any and all angles through the grass. We tried to follow our map and GPS as best we could, but nothing tallied with the paths we met. Eventually we gave up and turned due south, following our noses and hoping they would take us to the coast. Every now and again we would take a track that led to a dead-end and would have to double back. Soon we reached a better tended area – this must be the way! We carried on, Deb exclaiming how beautiful it was. Steps had been cut into the gentle grass banks, and we arrived at a peaceful glade which had been cut into a small meadow of wild grasses and flowers. A bench sat here. There was no view to the sea. 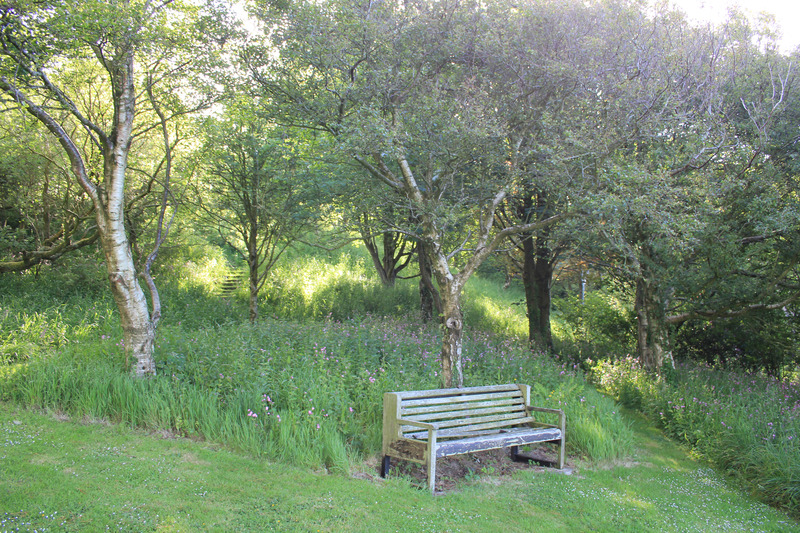 It was simply a lovely place to sit and reflect. It was a good thing we had started out early today, for we had inadvertently wandered into someone’s back garden. Just beyond the bench was an isolated house with a car in its driveway. We hurried back, quickly retracing our steps and diverting ourselves around the house before we were discovered. All of a sudden we hit a track which tallied with both our map and GPS – we were found again! By the time we reached the coast we had already walked nearly two miles. 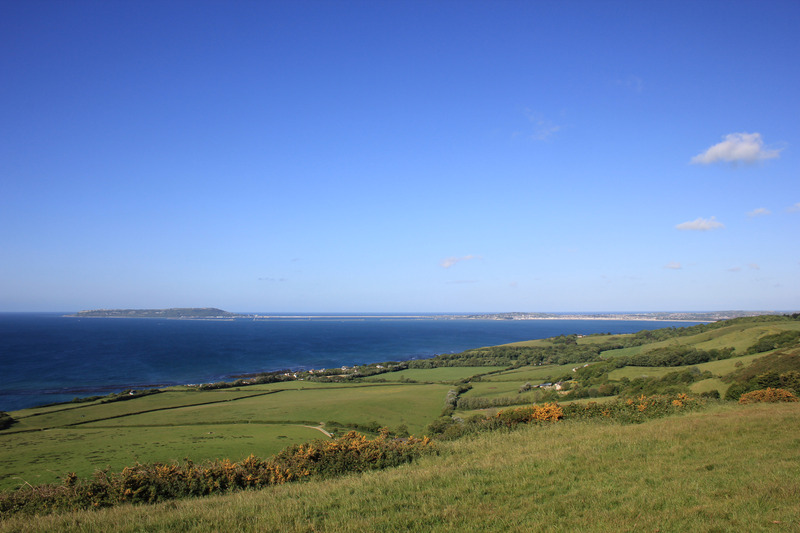 This entry was posted in Dorset and tagged coast, Dorset, lost, travel, walking. Bookmark the permalink. Lost in Dorset! My dream! This sounds like some of my geocaching adventures lol! Yes we’ve certainly experienced that too!!! Ha ha 😀 – sounds like my kind of walk! I’m always getting lost. And people think coastal walking is easy because all you have to do is follow the sea. Little do they know. We often find the start of walks tricky and have also ended up in a back garden in Loweswater, Cumbria. Lovely spot, just not the right one !